my Q+A series has been on hiatus over the summer, but in the spirit of back to school, we're kicking off this month's conversation with Sara (a.k.a. the chic lady behind Garderoben). Hi, my name is Sara, I’m a teacher and mother of two kids, 6 and 3 years old. I teach 16-19-year olds Sociology, Psychology and Political Science. I live in Malmö in the south of Sweden. like Sarah (formerly of Mommystyle), you're one of the most stylish working moms i know! how would you describe your personal style these days? how has it evolved over the past decade? Thanks! Well, my style is very simple and casual. I usually wear black, blue or grey clothes. Oh, and I have a thing for burgundy! Whenever I find something in a perfect burgundy tone I buy it. I don’t wear lots of bright colours or prints, except for stripes and plaid. I think that I’ve stayed true to my style for the past decade, but it has grown up a bit. For instance, about 10-12 years ago I used to love Marc by Marc Jacobs and Miu Miu, which usually are brighter, more youthful and playful than what I wear now. 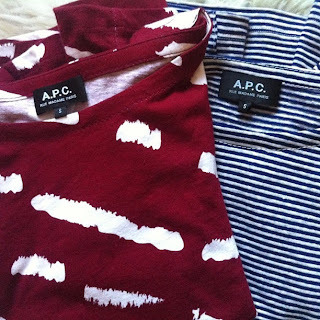 On the other hand, I’ve loved A.P.C since the mid/late 90’s. I remember when I was a student, before online shopping (! ), I’d save up for the arrival o f the A.P.C catalogue. It was like Christmas morning when it finally arrived! 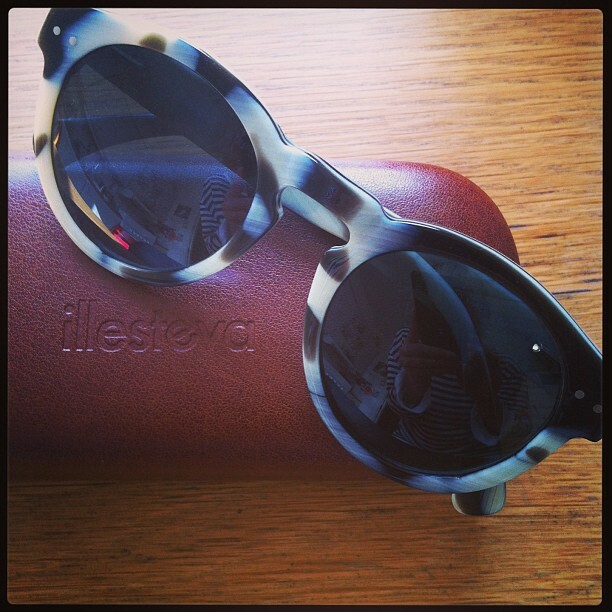 I seem to focus on a few designers that work for me, mostly Isabel Marant/Etoile, A.P.C and Hope. 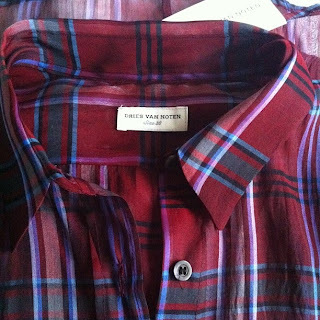 Lately I’ve been drawn to Dries van Noten too, but I’m doing my best to stay away, it’s just too expensive for me. what role does style / shopping play in your everyday life? Sometimes I probably spend way too much time thinking about style/shopping, but that’s usually when I become obsessed with one particular item. Especially if it’s sold out – then I’ll spend hours trying to locate it! Other than that I just enjoy feeling comfortable and good about what I’m wearing. do you have a style uniform? how does your work wardrobe compare with your weekend one? I definitely have a style uniform and plenty of wardrobe essentials. I almost always wear skinny jeans, usually black, with ankle boots and a loose top/shirt or knit. I find it much harder to dress for summer when it’s too warm for skinny jeans! I tend to dress a bit more bohemian then, like a pair of loose printed pants with a tee and sandals. I’m not nearly as comfortable with that though. Winters here can be pretty horrible and way too long, so cashmere, wool knits and great coats are essential. I usually wear my shirts and blouses with cardigans during winter. We don’t have a dress code at work, so no need for office clothes. My weekend wardrobe is pretty much the same, with the exception of silk blouses and cashmere knits! I love silk and cashmere, but that just doesn’t go with yoghurt fingers and play dates in the park. I always take it off the minute I walk through the door after work. My daughter sometimes says that I always look so nice when I go to work, and why don’t I wear that around the house? It’s kind of sad, but dry cleaning is so expensive here :)! Sometimes I feel like my students and co-workers are the only ones who see the good stuff, but that's not really true. Most of my friends have kids as well, so we make sure to meet up without the kids to catch up at least once a week. what bag are you carrying lately, and what's inside? I alternate between three bags. A big cognac Hope tote for work, a black Jerome Dreyfuss Tom bag and a small Jerome Dreyfuss Mini Twee. I use the Tom bag a lot. It’s usually way too stuffed, but I always bring my big Luella wallet or a small Comme des Garçons wallet, keys, lip balm, iPhone and earphones, water, a book and lots of napkins if the kids are with me. I keep dreaming about the Sofia Coppola for LV bag, or Saint Laurent’s classic duffle 6, but I haven’t been disciplined enough to save up for them. what do you love / hate shopping for? what do you splurge on? is there anything that you've purchased multiples of? I love shopping for shoes, I’m definitely more of a shoes than bag person. I’m also really excited if I find a great warm coat, since we tend to wear them for so many months of the year here. I hate shopping for socks and things that I need – like rain boots or a rain coat. I buy lots of multiples, it’s almost embarrassing. I recently discovered Frame Denim, by far my favourite skinny jeans ever, I alternate between three washes. 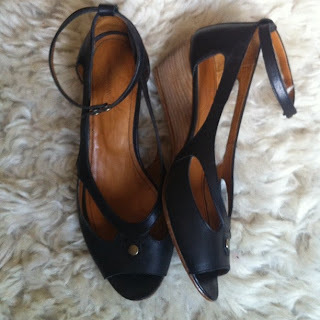 But I usually buy multiples when it comes to Isabel Marant pieces that go with everything. I have two different Isabel Marant blouses in black and white, the linen tees in several colours and so on. When I find something I really love I just get scared that I’ll wear it to shreds. Like the Dixie boots. Marant only made them for one collection, I love them to death and found a brown pair on eBay that I haven’t even used yet, I’m saving them until my cognac ones fall apart. It’s ridiculous! is there an item in your wardrobe that's particularly special? what's the story behind it? I'll have to say an item that I haven't even worn yet, an Isabel Marant mainline shearling coat that I just got. I've been looking for a great really warm winter coat for many years now. I have a Hope down parka and a nice Marant wool coat, but the wool coat isn't warm enough and the down parka isn't really exciting, but great for the playground/park when it's freezing outside. So, when I spotted the shearling coat on the Isabel Marant runway show I fell in love. I knew that it was going to be horribly expensive, and I've never been able to save up for anything like that before, I'm just not patient enough. I also thought a lot about spending that kind of money on clothes, could I really justify it? Is it worth it? To be honest, I still think that it's way too expensive, I've never spent that kind of money on a piece of clothing before, and I don't feel good about it. It'll take many years for the price per wear to be ok. But I decided that I had to at least try it on, so I had a huge wardrobe cleanout, sold lots of clothes and shoes on eBay, and now it's mine! So, in spite of all the ambivalence I love it...It's beautiful, the shape is classic and I know that it'll keep me warm for many many years. here in the US, there are certain regional style identities ('tailored all-black New York' vs. 'boho-chic LA'). how would you characterize Swedish style? are there similar 'regional trends' or cultural factors that affect how people dress? I'd describe Swedish style as not too different from the edgy and tailored New York look, a mix of H&M and Acne. Simple, somewhat edgy, mostly black and minimalistic. Swedish designers like Acne, Rodebjer, Dagmar and Hope are big here, and H&M is huge of course. As far as regional style identities I think that you have to go to Denmark to really see the difference. The Danish style, as I see it, is more boho chic with lots of layering and not as minimalistic. I live in Malmö, 20 minutes from Copenhagen, the capital of Denmark, and I'd say that people here dress more bohemian than in Stockholm. Maybe because of the Danish style influence? as a former blogger, what were some of your surprising discoveries / favorite things? how do you feel about blogs now? I still read and enjoy personal style blogs, but I'm afraid I don't comment as much as I used to. I really should, I know how important comments are. I started my blog when I was on maternity leave with my youngest child. Maternity leave is a wonderful thing, but staying at home with a baby made me miss the normal clothes that I'd wear to work, since spit ups don't do wonders for silk blouses :)! So when my son was asleep I'd put on something nicer, get a pic and write a short post. Not much later my dad passed away, and it might sound strange, but the blog helped me deal with my grief. It kept me distracted in a good way, I was able to completely focus on something other than my loss. I stopped blogging because it was so time consuming. I work full time, have two kids and I just couldn't find the time for it. I still have time for a quick instagram pic though! My favorite thing about blogging is definitely the friends I've made, and the feeling of being part of such an incredibly nice community. Sarah from Mommystyle mentioned it too in her interview, it's so special, and really surprised me. I never would have thought that I’d make a close friend through my blog, it’s pretty cool. what are you passionate about? who / what inspires you? I'm passionate about gender equality issues, I'm 100% feminist. I'm also passionate about discrimination in a wider sense, like racial profiling. I work a lot with issues like that with my students. My students actually inspire me in many ways, even though they make me feel really old sometimes! They're so much fun to be around. In terms of style I'm inspired by all the lovely women I met through my blog, way more than fashion magazines and big street style blogs. I blame Sarah for all the blouses I've been collecting since we got to know each other, and Aïssa for buying a Hope sweater that I had and sold two years ago - again! 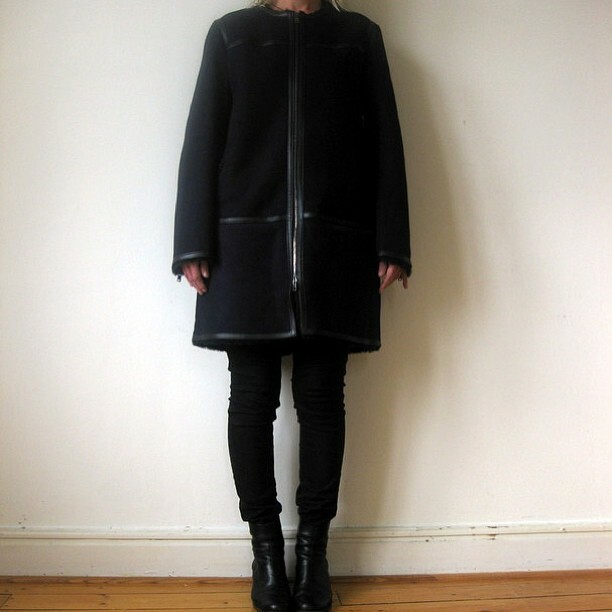 I also browse online stores like Totokaelo and La Garçonne for inspiration. Oh, these hot mothers you keep interviewing! I only wish they had more time to keep their blogs updated. They're certainly my role models for when I become a mom. Such a great interview! I'm lucky enough to email with Sara all the time, but it's still nice to see all the photos and inspirations all in one place. I really relate to what she said, about maternity leave leading to that desire to blog ... it's just such an odd time, when you are attached to the hip with this funny, messy little thing ... sometimes you just want to try in whatever small way to make a space for yourself and to feel normal. Ok, and that coat is beyond amazing! Such a stylish lady who strikes the perfect balance of practical and chic. This is such a great series. Sara, Sarah, and all the other women you've interviewed are such awesome, ball-bustin' babes! It's good to "see" her again. And it's interesting to read why people start blogging. it was Sarah's style blog (who i also interviewed earlier this year) but she has since deleted it. I like her style, but can't help noticing... Teaching must pay a lot better in Sweden than it does here in the US. I could never afford these clothes and shoes, even cleaning out my closet and trying to sell clothes on eBay (who would buy my non-designer clothes anyway?). Thanks for your comment! I'm afraid teaching doesn't pay well at all here, unfortunately. I don't get a lot of stuff at full price, I shop the sales and eBay. If I really want something that I'm willing to pay full price for I research it pretty early on, before it hits the shelves. It takes a lot of planning and saving up. Most of it, like Isabel Marant, has a good second hand value, so selling it makes it possible for me to get something else. When it comes to the coat, selling stuff wasn't enough, I'm still paying back my savings account:)! @Gauss - adding to Sara's comment above - i don't want to generalize too much as everyone's personal/financial circumstances are so different, but you'd be very surprised what you can afford by trying to buy less/better quality, with a mix of savvy shopping/sample sales/ebay. Really loved reading her answers, I think I'm similar to her in a sense that when I love something, I always have to buy multiples. It doesn't always work out for me quite as well as it does for her though. I loved reading both interviews with S + S. They both have such great style and in a perfectly, non-fussy way. It is truly inspirational. I would love to see more of this series! Fascinating interview. Really enjoyed it as I can so relate to so many things she says about style as a mom - spit ups and silk really doesn't go hand in hand at all. I just found that when I first had children, I just didn't want to look too "mumsy" and still retain a little of what I was before. It was a matter of finding a different style which worked for me. I think it's very important to do that. Your children are important but so is retaining your own identify. And I love that she has found her own style and uniform - so very wearable and replicable. 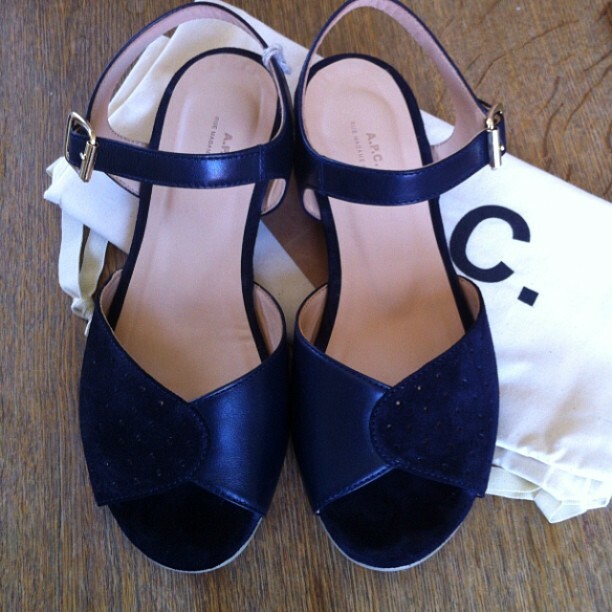 I have a question to Sara: where are those beautiful shoes next to the Chloé flats in the picture from? They're Isabel Marant from a few years ago! I'd been looking for them forever when I recently found a brand new pair on Ebay! that is so sweet, Kim - thank you! What a heartfelt interview! Thanks both of you for that thoughtful and articulate piece. Sara's personality is so endearing! I remember seeing her first blogging pics and being completely charmed by her style. Still am. Like Sarah said, it's nice to see it all put together in one place. Even if we have not actually met, I feel it's special to form a connection and being able to relate to the same tastes and share these common little experiences: like getting the APC catalogue by post ("in the old days") and greedingly browsing through it (I still check mine sometimes) or turning a search for a soldout item into an obsession! Also, in my defence, Sara, you're turning me into a Hope devotee! Thanks for your comments, I'm so glad some of you could relate to my replies! Thanks to miss Sophie as well for the interview, it was so much fun and made me miss my blog just a bit:). I find myself nodding my head as I read her answers. When you're a working mom but still enjoy fashion, you think of clothes a little different. IT's got to be practical too. I love that she has a uniform look that she sticks to but boy, does she look good in every single outfit! Great interview. I found myself nodding so many times at her answers, particularly the ones relating to motherhood. 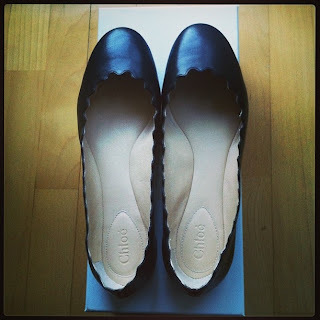 I myself am a mother of two, and am almost always have to be conscious about what I wear. Also, blogging really has helped me pass time/forget about my worries, but most importantly bloggers like Sarah and yourself, have helped me fine tune my style. So glad I have found your blog and Sarah's(3-4 years ago). i meant to tell you how much i truly enjoyed this post! i can totally relate to having to save up for a long time to have an item that i am really into. i also really love the way Sara dresses--there is something effortless and awesomely chic about her style. hot mama forreal! Such a heart warming interview! Sara's blog was one of the first that I read regularly and commented on. I'm really glad I found her blog- such inspiration. I couldn't agree more with buying multiples. When i'm lucky enough to find something that fits or have something made I always do this.